Are you finding difficult to perform keyword research from SEO point of view for your new website? Keyword Research is extremely important from SEO point of view. Keyword Research for new website totally depends on how well you know about your website. If you are pretty clear about the niche of the website believe me SEO Keyword Research process for your new website is not at all a difficult task. 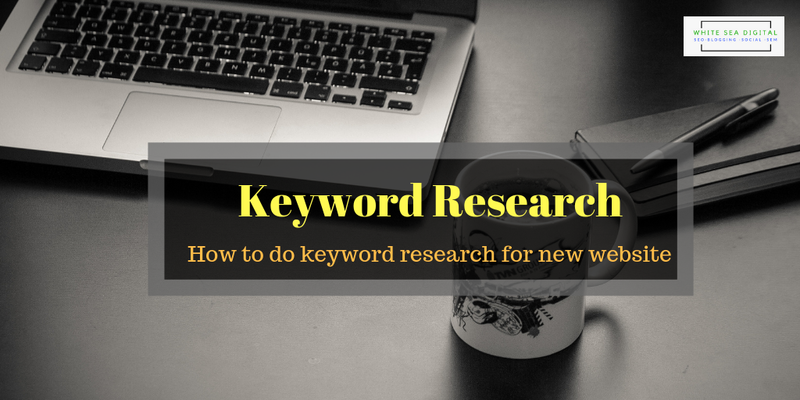 So, I am going to explain you each and every step of Keyword Research Process in the easiest way which you can implement website of any kind. Also, I assure you if you follow this guide and implement the process it will definitely boost traffic on your website organically. 1. Finalize niche topics and start with seed keywords. So, what do you mean by Niche Topics? Niche Topic is a topic in which your website will be focusing on. For example, if the content on your website is related to SEO. Once you are done with niche topics next comes in finding seed keywords. Seeds keywords are basic foundation keywords for SEO. Suppose, you are going to write an article related to Off-Page SEO. Try to build an extensive list of seed keywords. Be as extensive as possible. The number of seed keywords you include the better it would be. Now, you must be thinking from where to get the list of seed keywords? Search the keyword, then Google will automatically suggest you with best closely relevant keywords which you can include in your list. Another option is using actual tools for finding out what are the best possible keywords. There are many numbers of tools which you can use to find keywords. Keywordtool.io is the best tool to find the best unique keywords. Now, consider you are doing keyword research for an article related to Off-Page SEO. Enter the search term, select the location which you want to target and go ahead. As you can see I got a list of 150 unique keywords. Do the same thing for all the seed keywords and try to include all the keyword variations. Once you are done with creating all the list of keywords from seed keywords. Select the entire list. Now you will be having a huge list of keyword. You will have to determine which are the most important keywords for you. But, you will have to create own account. Go and Sign up on Google Adwords using your Google Account. Search volume is how many people have searched for that particular keyword in a given period of time. Find new keywords is what we have already done. Now, we have to get volume for those keywords. So go with Search Volume and Forecasts. 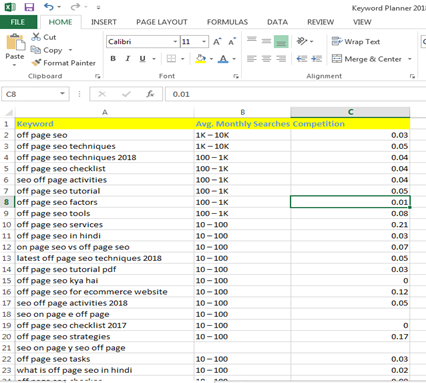 Copy the list of keywords and click Get Started. The first thing what you will see is Forecast which is about the future. But, we will focus on past i.e how much search volume have these keywords in the last 12 months. So select Historical Metrics. Download the data into excel file. You will get a huge data but the only metrics which you have to consider is the Competition and Avg monthly searches. You can delete the rest of the columns. Prioritize the keywords according to your article and evaluate the search volume and competition. Once you are done with this choose 4-5 keywords with decent search volume and low-medium competition. These are the essentials and the basic thing which you must do for keyword research for your new website. Selecting the correct set of keywords for your blog is very important but there are other things too. A good keyword strategy requires continuous monitoring. Thanks! This article was very helpful. Will love to read more from the author. My website provides digital retouching and custom art services at very affordable price. please, check it out if you like.